TruStone™ | R &D Marble, Inc.
TruStone™ can be fashioned into virtually any product R & D Marble, Inc. makes including showers, shower walls, shower floors, shelves, skirts, tub decks, splashes, sills and bathroom countertops and more. Enjoy your new or remodeled bathroom made with TruStone™. It will provide you with the beauty of full-slab stone and the functionality and durability of engineered composite while saving you money. This beautiful stone is created using a process called Photofuzion™. Photofuzion combines beautiful full-sized images of actual granite or stone with white engineered composite by using heat and pressure. This process will fuse the imagery into the gel-coated engineered composite. 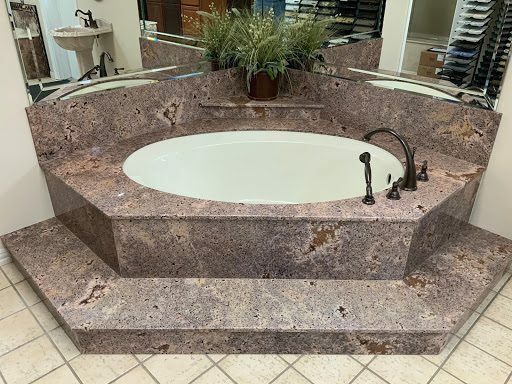 The resulting product provides the beauty of natural stone at a significantly lower cost, without the weight, porosity or finishing requirements. Choose from a wide variety of stunning images, designs, and shapes. Appearance: It looks just like granite or marble. Selection: Choose from our large selection of images today. Hygienic: It’s nonporous making it impervious to water, bacteria, mold, and mildew. Maintenance: Like all engineered composites, it cleans easily and requires no special sealers. Price: The cost of TruStone™ is a fraction of slab-style granite, marble or travertine. Installation: Because it requires no special footings or engineering and it is much lighter than slabs, it can frequently be installed in your home a single day.